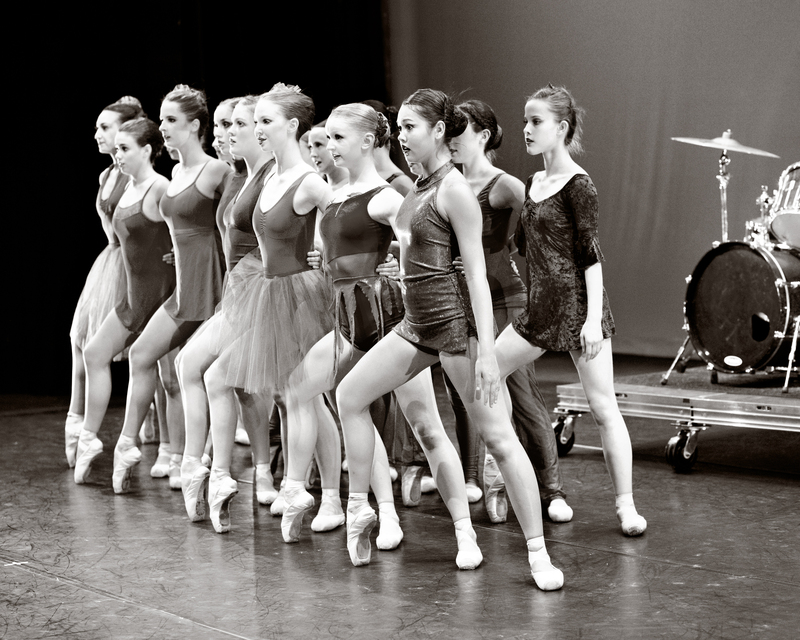 Students of Pro Arte Centre’s 2012 Half Day Training performing at SFU Woodward’s Milton Wong Theatre with Drummer Brad Tasker; photographed by Sarah Sedlacek. In 2007 Pro Arte started afternoon training for its Pre Professional Training Program twice per week with 5 students. Jump ahead to 2012 and we now see the program expanded to 3 levels with almost 40 inspired students starting their daily training at 1.30pm. The 3 different levels of Half Day training are: Pre-Intermediates and Intermediates (Level 1, ages 11-14); Advanced 1 (Level 2, ages 13-16) and Advanced 2/Aspirant Company members (Level 3, ages 15-19). Students take their schooling on-site at Pro Merita or in West Vancouver’s Super Achiever’s or North Vancouver’s Peak Program Schools. Students can specialize in Classical Ballet or Jazz and Contemporary and take daily technique classes, conditioning/stretching or pilates, pointe and/or jazz/lyrical/contemporary/modern. The program also involves weekly guest lectures in performance mental training/nutrition/audition planning/x-training techniques etc. This program supports family life with students at home for evening family meals and gives a holistic balance of academics, intensive training and ample performing opportunities and experiences. I would like to tell you that I received an email from one of my friends in the U.S.A. saying that your program is awesome and right one track. Previous PostPrevious What makes Pro Arte unique?